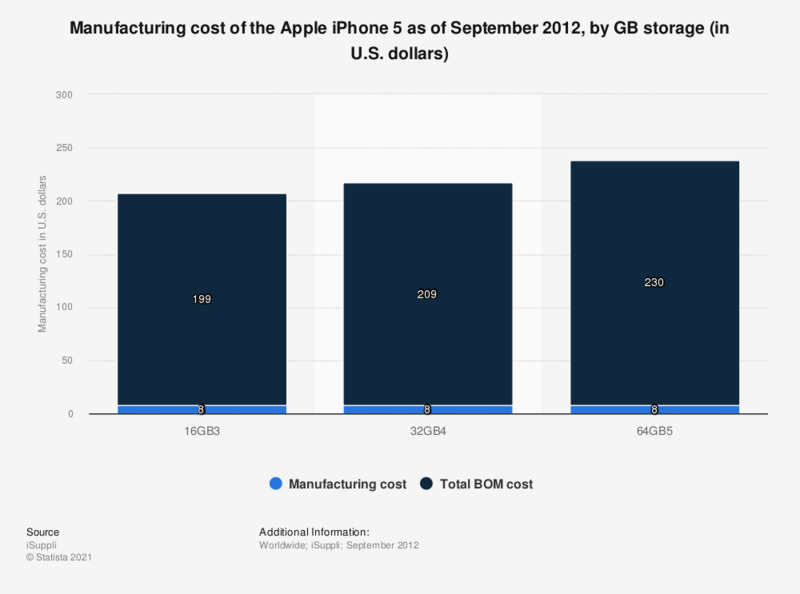 This statistic shows the manufacturing cost of the Apple iPhone 5 as of September 2012, by GB storage. The difference is shown between the 16, 32 and 64 GB releases. The price for the 16GB iPhone 5 smartphone at this time was 649 U.S. dollars while total manufacturing and BOM costs amounted to just 207 U.S. dollars. The source added the following beneath this statistic: "Please note that these teardown assessments are preliminary in nature, account only for hardware and manufacturing costs and do not include other expenses such as software, licensing, royalties or other expenditures."